Carrera marble of exceptional close grain and purity (commonly referred to as “Michelangelo”). French sculptor and medallist, Marcel Renard, a Rome Prize winner, studied first in Lyon under his father, the sculptor Leopold Renard (1868-1870), subsequently with Jean-Marie Boucher (1870-1939) and Auguste Patey (1855-1930) at the Ecole des Beaux-Arts in Paris. He was the standard bearer of an elegant and refined neoclassical style. One of the most famous medalists of his age, Renard produced several hundred works for the Paris Mint – medals of rivers (The Seine, The Loire, The Rhone, The Garonne, The Rhine and The Meuse) and plaquettes, Young Girl with Doves, The Exchange and Jules Massenet , among many others. 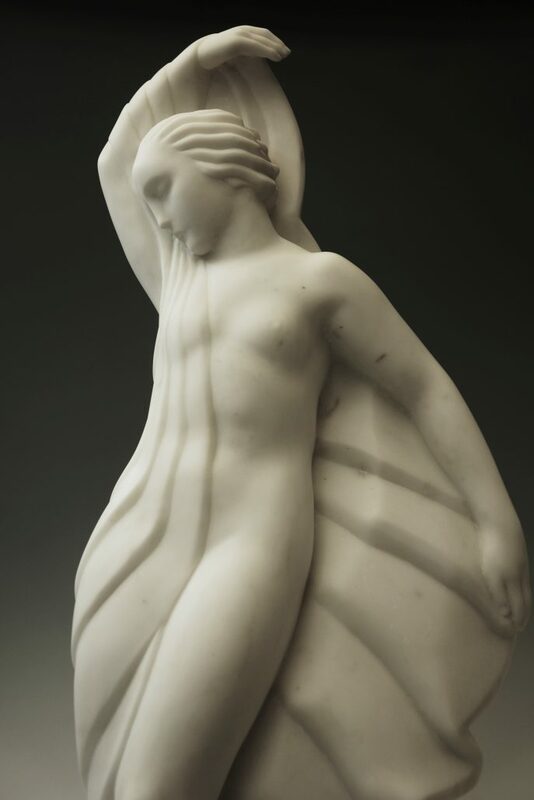 Renard also realized public monuments in the round, fountains and sculptures for the Salon International des Arts Decoratifs of 1925, which gave birth to the expression Art Deco. Marcel Renard won a gold medal at this event. In addition to his work as a medallic sculptor, Renard created elaborate interior decors for luxury ocean liners, such as the Ile de France. In this capacity, he collaborated regularly with friend and colleague, the monumental sculptor Alfred Janniot (Rockefeller Center, Palais de Tokyo.) Renard also realized numerous interior decorations with the architect Roux-Spitz. the bather’s charms and on the figure’s proper left side, a “scalloped” border of fabric (suggesting the Pecten Maximus, the coquille Saint Jacques of the sculptor’s Renaissance predecessor, Botticelli) flutters in the breeze. The artist embellishes the verso of his sculpture with an abstraction. Unique in form, it is the indefinable amalgamation of fabric and seashell. According to Greek myths, Venus was born from water. Renard’s sculpture, made for water, is in complete harmony with it. 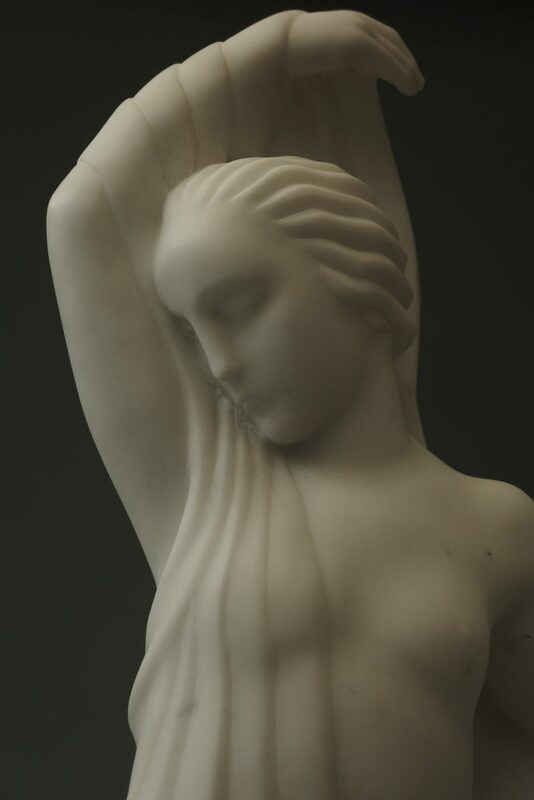 The purity of close-grained Michelangelo marble and its glowing whiteness enhance the goddess’s’ divine presence, and the rivulets that cascade rhythmically, when water descends along the folds of fabric, caress her form and exalt the fluid element from which she emerges. 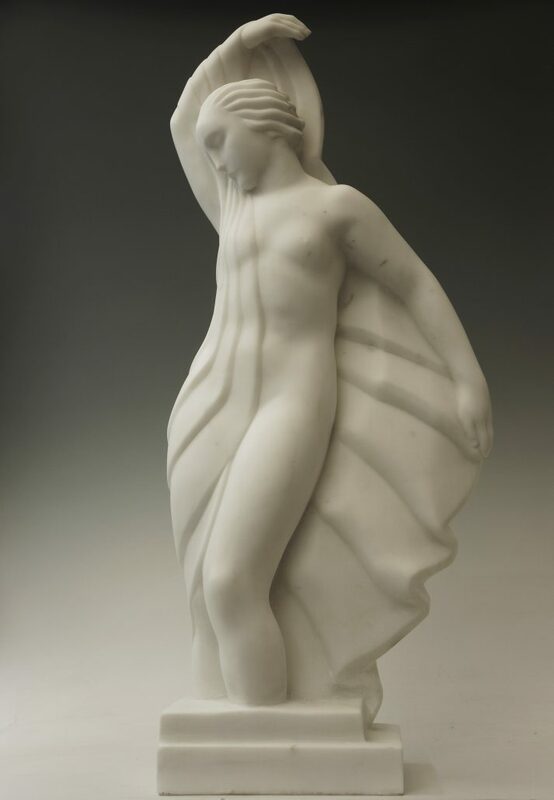 Sculptures by Renard are held by many important public collections, including that of the Dansmuseet , Stockholm; the Musée des Beaux-Arts of Lyons; the Victoria and Albert Museum, London (six works); the Design Museum, Ghent and the Musée des Années Trente, Boulogne Billancourt, near Paris, the principal French museum dedicated to the Art Deco movement. A major monograph on Marcel Renard by the French curator, Emmanuel Bréon (former director of the Musée des Années Trente) is currently in preparation.